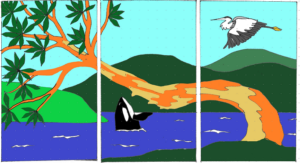 Contribute to our Mosaic Mural and have your name installed on the project! 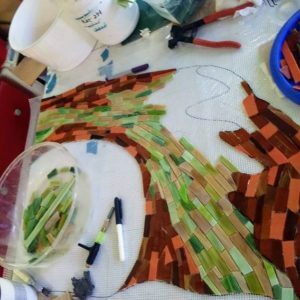 Mosaic artist Jennifer Kuhns is generously supporting a mosaic installation for Arbutus to commemorate our 5th Anniversary and we want YOU to be a part of it. Please consider donating ANY amount to help us purchase supplies! Arbutus has grown because of the dedication of those who love it. We want this project to reflect the community effort that has helped Arbutus grow and thrive! The 9’x5′ triptych mural echos the Madrona tree of our logo (and namesake) as well as familiar Northwest landscapes and creatures. Sponsors will have their names acknowledged in the project. Thank you Arts Walk community helpers, Jennifer Kuhns, and workshop attendees! Our mural is well underway and a sight to behold. Community members joined in during Artswalk, helping assemble sections. 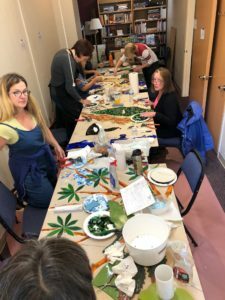 Then our amazing workshop attendees enjoyed a two day instruction on mosaics from Jennifer Kuhn’s, while continuing to bring this work of art to life. See the progress we’ve made and support this amazing mosaic! Arbutus Folk School is a 501(c)3 nonprofit – your contribution is tax deductible. Our tax ID is 46-3046450.